First period. Classic example of early salt-box; quarter round bead on summer beams and posts in earlier hall; restored interior sheathing and large fireplaces. Central door, 8/12 windows. The Blanchard-Upton House has one, of only two rooms in Andover, completely sheathed in pine on all four sides. The house likely began as two rooms, one downstairs to left of entrance and chimney and one above. The west side and oldest section contains "Indian Walls", a brick barrier between the inner and outer sheathing used as defense in early Colonial days. As family grew, the house was extended eastward, upstairs and down. The salt-box section was likely added at the time of the east wing, but others believe it to be the third part built. The old kitchen room now serves as a dining room, has a 12' mantle which marks the site of the original fireplace. The massive 10' wide fireplace remains, one of the largest in Massachusetts. The east fireplace is slightly smaller at 8’. An old stairway built against the wall of the chimney without props in a spiral construction. 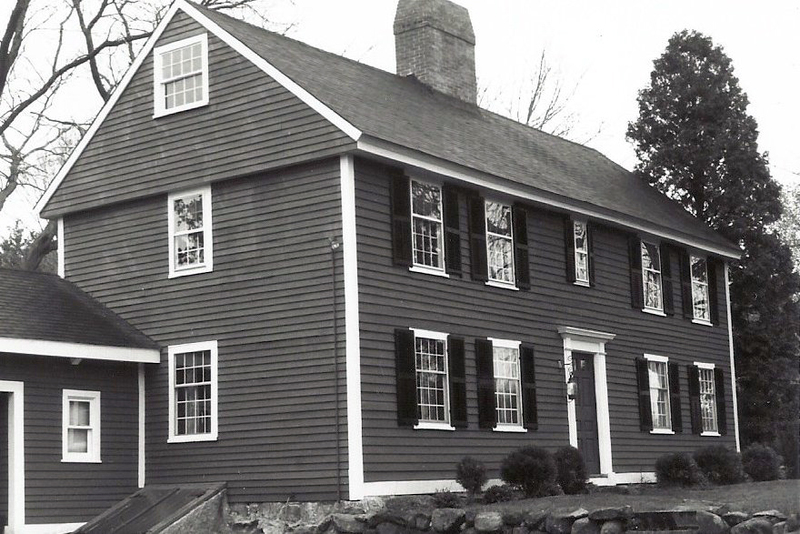 1987 nominated to NRHP under a thematic nomination of First Period houses in Essex County by Boston University AMNES. Themes Agricultural, Architectural and Community Development. 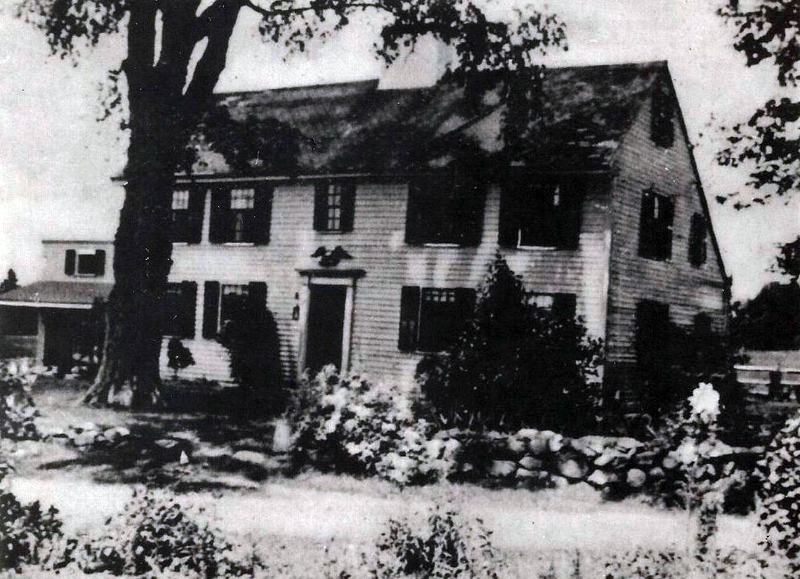 Samuel Blanchard, father of Thomas, owned land in Andover as early as 1662 in "West Andover" and with 2nd wife Hannah had a garrison house at 36 Haggetts Pond Road. Samuel died on April 22, 1707, first burial of record in West Parish Cemetery. Samuel's father Thomas Blanchard came to Boston on June 23, 1639 on the ship "Jonathan” with his second wife Agnes (Bent) Barnes, his five sons; George, Thomas, Samuel, Nathaniel, Joseph and mother in law and a niece. They had been ill during the voyage and wife Agnes died at sea. Agnes mother died as the ship anchored in Boston harbor. They first settled in Charlestown then to Braintree in 1646, then back north to Malden in 1650. Thomas remarried to Mary and he died on May 21, 1654. Sons George and Thomas settled in Medford, Nathaniel went to Weymouth and it is not yet known where the youngest Joseph settled. Samuel Blanchard born August 6, 1629 Hants, Penton Grafton, England and would have been nearly 10 when they arrived in Massachusetts Bay Colony. Samuel, a husbandman, was a constable in Charlestown in 1657, married Mary Sweetser on Nov. 3, 1654 and had six children: Samuel b. Sept. 29, 1656, Sarah b. Feb. 15, 1657, Mary b. 1659, Joshua b. Aug. 6, 1661, Jonathan b. May 25, 1664 and Abigail b. March 5, 1668. Wife Mary died Feb. 20, 1669. Samuel remarried on June 24, 1673 to Hannah Doggett. Samuel & Hannah had four children all born in Charlestown; Thomas b. Apr. 28, 1674, Jonathan “John” b. July 3, 1677, Samuel b. June 4, 1680 and Hannah b. Sept. 26, 1681, Samuel moved here with this family on June 10, 1686 from Charlestown, MA. Samuel Blanchard was a land owner in Andover as early as 1662. He served as selectman here in 1683. Samuel owned over 200 acres in West Andover extending from Haggetts Pond, once called Blanchard's Pond, to south of 62 Osgood Street and extending to the Tewksbury line (Billerica), an area referred to as Blanchard’s Plain. Samuel died on April 22, 1707 and was buried in the West Burying ground established in 1692, the first burial of record and oldest headstone. Samuel gave land on Osgood St. to his son Thomas Blanchard at the time of his marriage in 1699. Thomas, a Cordwainer / shoemaker and likely a miller with a location of a grist mill along the stream crossing Hearthstone Place. Thomas married Rose Holmes on March 22, 1698/9. They had nine children; Thomas b. Jan. 15, 1700, Joseph b. Feb. 19, 1701, Isaac b. Sept. 20, 1702, Josiah b. Aug. 16, 1704, Elisabeth b. Mar. 25, 1706, Hannah b. May 6, 1708, Roas “Rose” b. Jan. 12, 1709, Deborah b. Apr. 18, 1712, Lida b. Aug. 22, 1714. Sadly wife Rose died on Aug. 27, 1714 at age 40. Thomas remarried on Sept. 21, 1715 to Mrs. Hannah White Cowens of Lynn. Tom & Hannah had three children; Mehitable b. Oct. 3, 1716, Nathaniel b. Feb. 2, 1719 and Isaac b. Oct. 9, 1723. Hannah died in 1724. Thomas married a third time on Feb. 21, 1725 to Mrs. Judith (Buckman) Hill, widow of Zachary Hill of Malden. Two children are listed from this union; Simon b. Mar. 16, 1725 in Billerica, and Abiah Hill b. 1726. Thomas died on Mar. 17, 1754 in Andover. 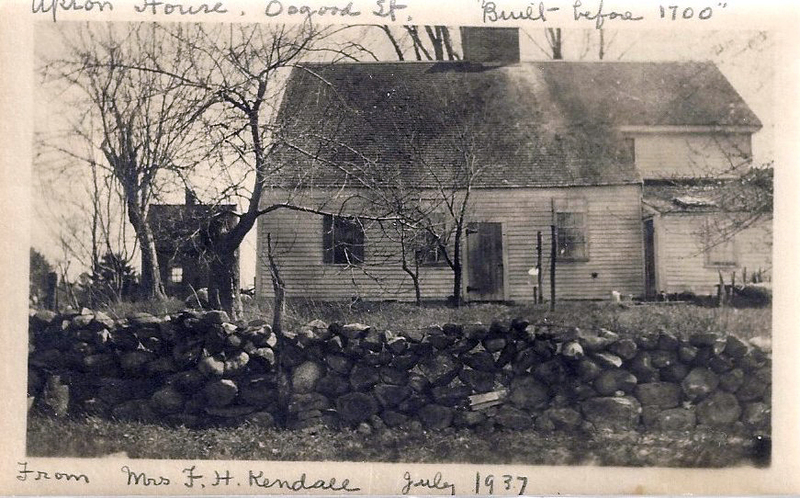 He sold the homestead farm of 37 acres for 120 pounds to his 4th son Josiah Blanchard on May 14, 1741 (rec. 12/4/1746). Josiah, a Yeoman, married Sarah Blanchard b. May 9, 1712 dau. of Samuel & Sarah (Johnson) Blanchard. Josiah & Sarah had nine children: Sarah b. Feb. 27, 1731, Abigail b. Sept. 23, 1734, Elizabeth b. Apr. 3, 1738, Josiah b. Oct. 10, 1740, Eunice b. Oct. 30, 1742, Joshua “Josiah” b. Nov. 13, 1746, Benjamin b. July 3, 1750, Samuel b. 1754 Andover, MA and Ann b. May 2, 1767 in Wilton, NH. Josiah lived here from 1740-1765 then moved to Wilton, NH. His son Josiah Jr. b. Oct. 10, 1740 then took the farm. Josiah Jr. was a Cordwainer and may have built the cobbler’s shop on the property. Josiah married on Oct. 17, 1765 in Andover to Lydia Jenkins b. Nov. 9, 1746 Andover, dau. of Samuel & Rebecca Jenkins. Josiah and Lydia had six children: Lydia b. Aug. 3, 1766, Hannah b. Oct. 19, 1769, Josiah III b. Sept.3, 1771, Isaac b. Dec. 14, 1775, Molly b. Mar. 16, 1783 and Samuel Jenkins b. July 2, 1786. Josiah died on Apr. 30, 1790. His widow Lydia, inherited the use of east end of house and carefully marked the boundary of land which cut property into a third share. 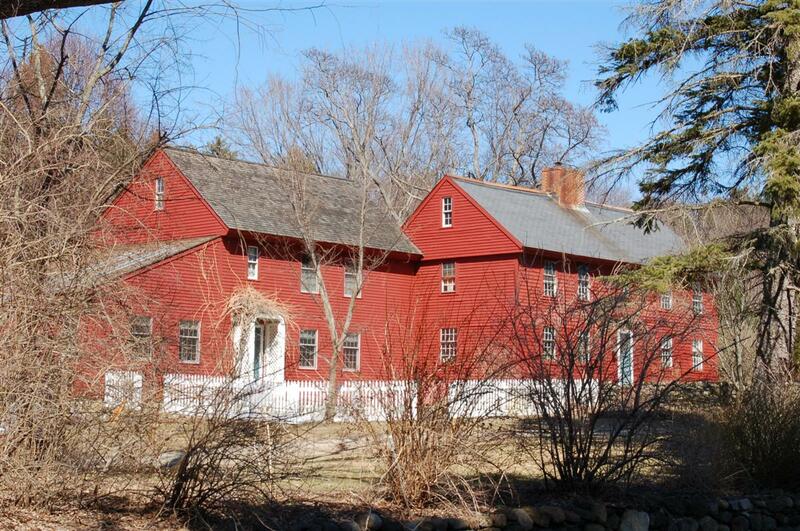 The remainder 2/3 of farm and house was sold to Abiel and Molly (Jenkins) Upton on June 3, 1791. Molly was Lydia's niece, daughter of her brother Samuel. Lydia Blanchard later remarried to Luther Bailey (Bayley) and died on May 21, 1818. Her portion of the Blanchard homestead with 37 acres was purchased from her heirs by Abiel Upton for $713 on Sept. 22, 1818. Abiel Upton b. Oct. 20, 1755 in Fitchburg, MA, son of Caleb & Mary (Stewart) Upton married on May 29, 1788 to Mary “Molly” Jenkins b. July 23, 1768 dau. 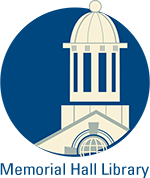 of Samuel & Anna (Upton) Jenkins. Abiel & Molly had eight children; Mary b. Mar. 31, 1789, Abiel Jr. b. Apr. 1792, Samuel b. Mar. 31, 1796, George b. Nov. 10, 1799, Abiel b. Apr. 14, 1802, Anna b. July 30, 1803, Elizabeth Mar. 9, 1805, and Margaret b. June 5, 1809. Abiel & Molly have a Bond with Samuel Jenkins on Dec. 14, 1820 and deed the 130 acre farm, with dwelling house, barn and all other buildings to him. Abiel died at age 74 on Aug. 15, 1831. Abiel appears to have sold the farm to son Samuel Upton for $300 on Oct. 15, 1827 as all the deeds are noted include the Blanchard farm. Abiel died on Aug. 15, 1831. Samuel, a laborer, was married to Lydia Frost in 1820 and had four children; Henry b. 1823, Warren b. 1826, Samuel Darius b. 1828 and Alphens b. 1831. Sadly Samuel was killed in the sawmill at Ballardvale on Apr. 24, 1834. The 1830 map of Andover lists S. Jenkins at this location. It has been stated that Samuel Jenkins (Molly’s brother) held the property from 1820-1842. (Present owner (Grant) doubts that Jenkins and wife, Lydia Damon ever lived here, as they owned much land elsewhere, including Holt's Hill). 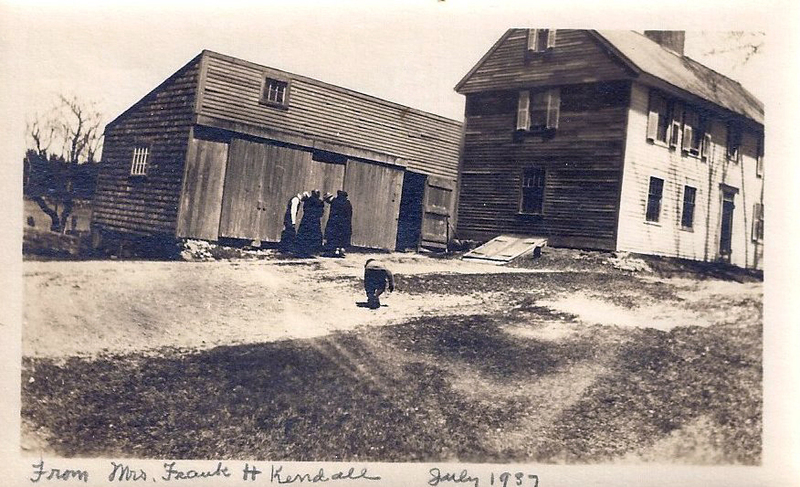 Abiel’s son George Upton then acquired the homestead farm on Feb. 17, 1842 from Samuel Jenkins. George Upton’s marriage intention on Nov. 4, 1825 to Elizabeth Hardy b. Nov. 21, 1800 dau. of Ezekiel Jr. & Hannah Eliz. (Clark) Hardy. George & Elizabeth had six children: Eliza Ann b. Dec. 7, 1827, George Wm. b. June 2, 1829 – d. Feb. 16, 1843, Martha Jane b. June 2, 1831, Abiel Augustus b. Feb. 25, 1833, Mary Louisa b. Feb. 19, 1836, and George Henry b. May 15, 1846. 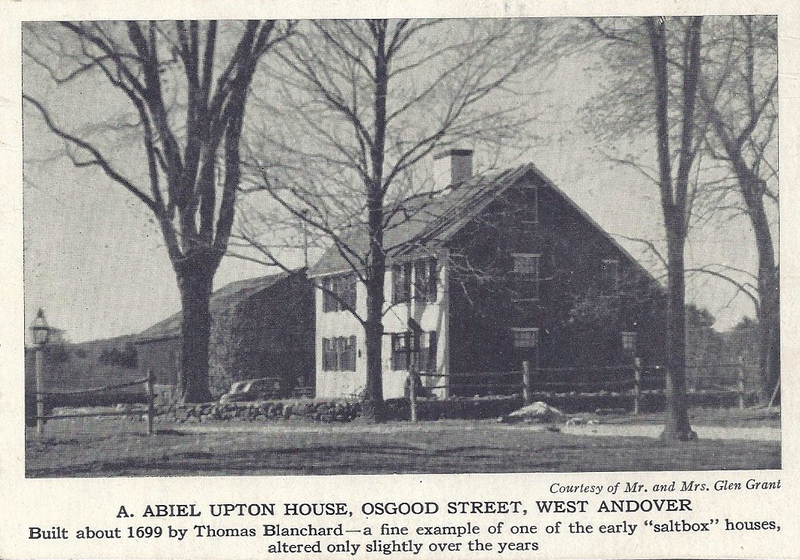 The 1850 Andover Valuation schedule lists George Upton: Dwelling house $400, barn $125 49 acre farm $1029 = $1554. His farm stock value $152. Wife Elizabeth died on July 18, 1875 and George on Mar. 14, 1878. Son A. Augustus inherits the farm. Augustus never married, was a shoemaker and worked the land until his death in 1921. The 1880 Census lists his widowed sister Eliza A. Kendall age 52, keeping house with her brother, a 13 year old nephew McDonald and Lucy Shed age 16, servant. By 1920 Augustus now 86, shares the homestead with his brother George Henry Upton age 73 and housekeeper Eliza A. W. Emerson age 66 widow. The 1920 Valuation includes the shoe shop $50. Augustus died on April 7, 1921. His estate went to the remaining Upton heirs. At this time presumably, the more valuable Upton furniture was sold and placed in the Wayside Inn. The sea-horse weather vane was not sold and remains (1975), but fell apart from wear. Eban & Addie F. (Upton) Goodrich occupied the property a few years. The Upton heirs then sold the farm to William B. & Mary M. (Fraize)Baker on June 29, 1926. William B. Baker b. 1877 in Nova Scotia, Canada, married Dec. 23, 1899 in Andover to Mary M. Fraize b. 1876 in Newfoundland, Canada. They had eight children of which five survived. William worked for the town of Andover as Foreman of the Street Dept. William purchased the Upton farm but never lived here. It was occupied by his son Walter Harold Baker for about four years. Walter was born in Andover on June 12, 1902 and worked for the Water Dept. He married Hazel G. Brougham b. Nova Scotia and had three children; Walter William b. 1924, Mary Alice b. 1927 and Hazel F. b. 1930. They had moved to Bakers Lane after the April 1930 Census. 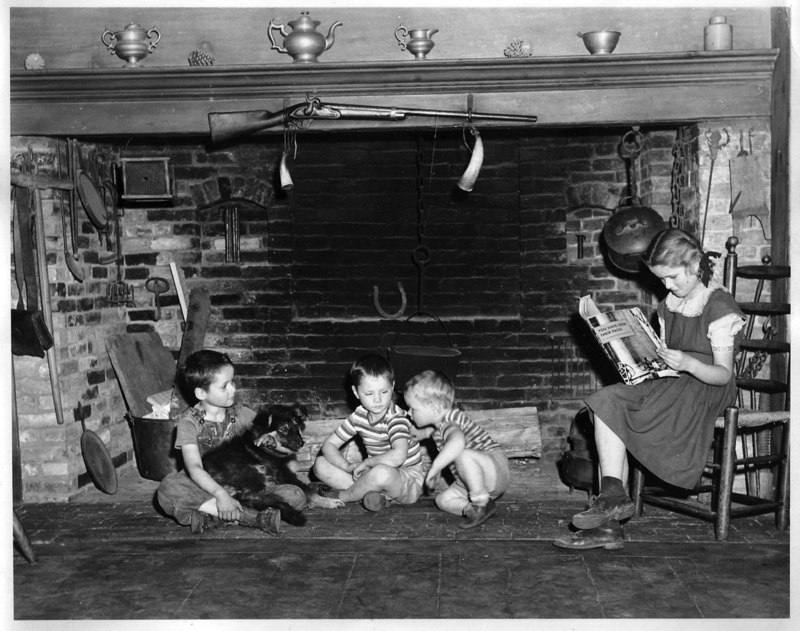 William B. Baker later sold the homestead to Glen W. & Jane C. Grant on Jan. 9, 1939. Grant then purchased the 47 acres lot on Jan. 22, 1940. Glen Wright Grant was born in Nyack, NY on Mar. 15, 1905, son of William & Katherine (Hall) Grant. Glen grew up in Geneva, NY, married in Scranton, PA on Mar. 27, 1936 to Jane Cowdrey b. May 10, 1913 in Scranton, PA dau. of Nathaniel and Dorothy (Warren) Cowdrey. Glen worked as a Wholesale Salesman for Shuron Optical Co. in Boston. When they moved to Andover in 1939 Glen worked for Lawrence Optical Co. Glen would later start “Woodcraft Products” in a barn on his property making custom cabinetry. A Seahorse logo was used with his business. The Grants made extensive repairs to the house during their ownership. Jane C . Grant was a teacher at Pike School in Andover. Glen and Jane had four children: Glen G., Gael, Celt, and Mac Clanning. Glen, Jane and son Celt did a stint with the Peace Corps in 1965. On a trip to Mexico Glen W. died of heart failure on Feb. 12, 1969. Jane continued to live in the homestead and placed the property into the Earth Grant Farm Nominee Trust on Sept. 10, 1977. The Grant family sold off lots on the farm and later the homestead parcel created the Hearthstone Place development. The old Cobbler’s shop was sold in 1988, dismantled and moved. Richard A. & Joann Michalik purchased the homestead and 4.5 acre lot on June 15, 1989. The Michaliks have spent the past 28 years restoring the house and barn. The new two story west ell was designed by architect Alfred DiBiasco of Groveland, MA and constructed by Jim Dole, Groveland in 1997-98. The Michaliks received a Preservation Award for Sympathetic Addition in 1998 for their efforts. Cobbler's shop (used by both Blanchard and Upton), Dismantled in 1988. See photos in AHS files under business: shoemaker. Major Alterations Remodeled by Grant in 1940's - new floors, Mid 1800's barn restored. 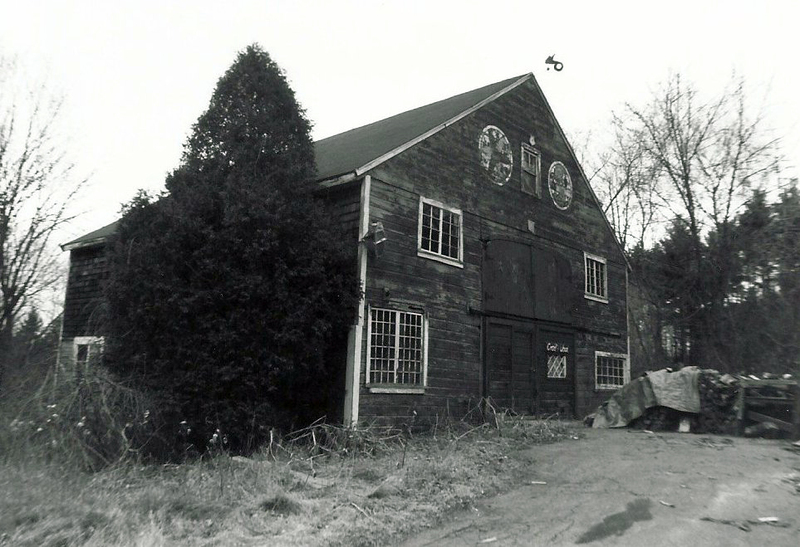 Original barn razed 1988; shoe making shop dismantled and moved off property 1988. Carriage shed converted into in-law apt. by Grant, removed and addition added 1995; rebuilt/preserved chimney in 2000. 7 Hearthstone Place, formerly 62 Osgood St.